Once per turn: You can send 1 "Infernity" monster from your hand to the Graveyard. 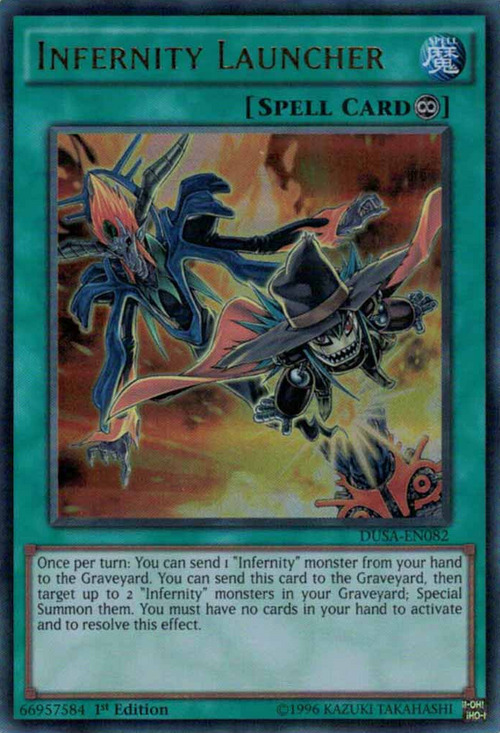 You can send this card to the Graveyard, then target up to 2 "Infernity" monsters in your Graveyard; Special Summon them. You must have no cards in your hand to activate and to resolve this effect. Infernity Archfiend and Infernity Avenger appear in this card's artwork. The appearance of Launcher is similar to Infernity Destroyer. Upon closer inspection, Infernity Archfiend can be seen smiling to the point of revealing teeth. This card's effect mechanics are reverse of Wave-Motion Inferno. Wave-Motion Inferno has a no-hand effect on the field and a hand-clearing effect that activates if the owner sends it to the Graveyard. This card has a hand-clearing effect on the field and a no-hand effect activated by sending it to the Graveyard. Both effects of "Infernity Launcher" start a Chain. You can add "Infernity" cards that are not monsters to your hand with the effect of "Infernity Archfiend", including "Infernity Launcher." If "Infernity Launcher" is the only card in your hand you cannot activate it and activate its effect to Special Summon in the same Chain. If only 1 of the target monsters is in the Graveyard when the effect to Special Summon resolves, it will still be Special Summoned. Sending "Infernity Launcher" from the field to the Graveyard is a cost to activate its Special Summoning effect. The effect of "Infernity Launcher" which Special Summons monsters targets one to two "Infernity" monsters in your Graveyard. The effect of "Infernity Launcher" which sends a card from your hand to the Graveyard and the effect which Special Summons monsters from the Graveyard both each start Chain Links. When "Infernity Launcher" is activated from the hand, you cannot Chain the effect of "Royal Oppression" to negate the effect and destroy it. When a face-up "Infernity Launcher" is sent to the Graveyard to activate its effect, you can Chain the effect of "Royal Oppression" to negate the effect and destroy it. : When "Infernity Launcher" is activated, can you negate the effect with "Royal Oppression"? When resolving the effect of "Infernity Launcher", if one of the targeted "Infernity" monsters is no longer in the Graveyard, then remaining "Infernity" monster which is still in the Graveyard is still Special Summoned. : If one of the monsters selected by "Infernity Launcher" is no longer in the Graveyard, then can the remaining monster be Special Summoned? If an effect like "Jar of Greed" is Chained to the effect of "Infernity Randomizer" so that you have one or more cards in your hand, then you cannot apply the effect of "Infernity Randomizer". This ruling also applies to similar cards, like "Infernity Archfiend", "Infernity Destroyer", "Infernity Beetle", "Infernity Avenger", "Infernity Launcher", etc. : If you have one or more cards in your hand when resolving the effect of a card like "Infernity Randomizer", then can you draw? You can also use the effect of "Infernity Archfiend" to add "Infernity" Spell or Trap Cards to your hand, such as "Infernity Launcher". : Can cards like "Infernity Launcher" be added to your hand by the effect of "Infernity Archfiend"?